Does Auto Lotto Processor Really Work? Read Reviews! Auto Lotto Processor is a software aimed at helping you “crack” the lottery code and increase your chances of success through the selection of the right numbers. Auto Lotto Processor Exposed — A Guaranteed Win or a Massive Miss? The moment you open the Auto Lotto Processor website, you’re welcomed by a large red sign about a woman who won 100,000 dollars from the lottery by using the software. If you want to win the lotto at any cost, chances are that you’ll be impressed and would want to give Auto Lotto Processor a try. After all, the software that guarantees such massive prizes should be worthy, shouldn’t it? Hold your horses! The man behind Auto Lotto Processor has a long, long history and a lot of it isn’t as positive as he would like it to be. What Is Auto Lotto Processor and What Does It Do? Auto Lotto Processor is yet another piece of software in the portfolio of Richard Lustig – the man who gave the world Lottery Dominator and Lotto Decoded. We will take a more thorough look at Lustig’s lottery history in one of the coming sections. The Auto Lotto Processor website is as filled with advertising clichés as a candy store is with eager children. There are pictures of dozens of people who won the lottery using this software to crack the code. Lustig also shares that he hired 5statistical analysis experts, four advanced theory experts (whatever that is) and three computer science graduates to develop an algorithm aimed at helping users pick the most favorable lottery numbers. Unfortunately, the presentation does not reveal how these numbers are chosen, whether statistical analysis is employed or if the formula is based on hot and cold numbers. Behind the market hype there is… nothing. There’s one very, very, very important thing research has revealed about Auto Lotto Processor. Richard Lustig has an affiliate program – people who advertise his software and generate a sale will get a percentage of the proceeds. As a result, there are dozens of fake, excessively positive Auto Lotto Processor reviews online. None of them are genuine and they all sound the same, which is why the marketing texts are easy to recognize. Please do not fall for these reviews – their authors have a pronounced interest in making you think that Auto Lotto Processor is the most potent lottery software on the face of the planet. Here’s the big kicker – Lustig is one greedy, greedy guy. The Auto Lotto Processor comes with a modest price tag of 127 dollars. Do you know how many lottery tickets you can buy for this amount in order to test your luck? Alternatively, you can opt for a free of charge predictor based on hot and cold numbers. At least you will know the theory behind the choice of one digit or another. Even after reading the entire Auto Lotto Processor website page (believe us, it’s a long, tedious and boring read! ), it still doesn’t become clear how the software works or what Lustig’s revolutionary formula is. 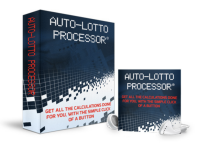 Auto Lotto Processor is a rehashed version of the other software products Lustig has out there. Obviously, this guy wasn’t satisfied with the sale of the previous programs and the books that he has out there. As a result, he has had to resort to clone creation. This software doesn’t feature anything new or more impressive than Lustig’s previous attempts. And once again, the presentation is vague on purpose and it doesn’t deliver any valuable information. According to Lustig, hundreds of people are using Auto Lotto Processor’s formula to earn 25 to 35 dollars from the lottery per week. We did a lot of research to find the stories of at least a few of these lucky winners online. Not a single person has bragged about using Auto Lotto Processor to win on a weekly basis. We leave the conclusion to you. Auto Lotto Processor’s promo page does not have terms and conditions. If the previous information did not raise a red flag, this one definitely should. Lustig doesn’t make any promises about maintaining your privacy or offering you a certain type of support for the money you invest in his software. Once you go to the Auto Lotto Processor checkout page, you’ll see a brief terms and conditions statement at the bottom of the payment form. The statement suggests that people who buy Auto Lotto Processor are entitled to a 60-day money-back guarantee (this is a standard ClickBank guarantee as Lustig is offering the software through this platform). The statement also warns you that by entering your email, you are agreeing to the vendor using it to fulfill the purchase and for marketing purposes. As a result of this statement, you will probably be bombarded by Lustig’s spam in the future. If you don’t want to get unsolicited messages in the future, you may want to think twice about downloading Auto Lotto Processor. Who Is Behind Auto Lotto Processor? Richard Lustig’s name has been mentioned in this review multiple times already. To paint a complete picture about who he is and what he does, we’ll have to take a look at his history. Richard Lustig became famous in 1993 when he won the lottery for the first time. Since then, he has won a total of seven times. He won both lotteries and scratchcard games. The total sum of prizes he accumulated through the years is 1.047 million dollars. There is nothing revolutionary about the formula Lustig uses to win. In fact, he has mentioned it several times in interviews. The information is also featured in the book that he wrote in 2013 (still available on Amazon and you may want to go through the reviews – some of them are hilarious). Lustig buys multiple tickets, plays the same numbers and never misses a drawing. When playing scratch games, he acquires an entire batch of tickets from a retail venue. So many statisticians have already confirmed that this approach will lead to winning – multiple entries increase the odds of claiming a prize. The prize, however, could be much lower than the amount invested in participation. This is the big secret and the most important factor nobody addresses. While Lustig has won 1.047 million dollars through the years, he has never revealed just how much he has spent on tickets. A person who’s a lucky millionaire, however, will not have to turn to software sales in order to support himself. All of the desperate attempts Lustig is making to push his dozens of cloned products are indicative of something not being completely right. Would you mind rating Auto Lotto Processor? In our opinion, Richard Lustig has finally lost it. His previous products were priced in the range from 30 to 50 dollars. Auto Lotto Processor comes with a ridiculous price. Even if there’s some statistical merit behind the formula, you can find similar lottery number predictors for free. We all want to be big winners and marketing plays with this desire. Lustig is particularly skilled when it comes to pulling on emotional strings. The pictures of lucky winners holding large cheques on all of his promo pages make potential buyers wish they had a similar experience. Unfortunately, Lustig’s products aren’t the ones that will help you get there. Auto Lotto Processor misses the mark completely – there is no statistical justification or explanation of how it works. A genuine product will display its strengths proudly. All that Lustig makes is empty promises. Please save your money and do not get fooled by skilled salesmen like Richard Lustig. Auto Lotto Processor is not going to do anything for you, which is why this exceptionally overpriced software gets a 1 out of 10 stars rating.